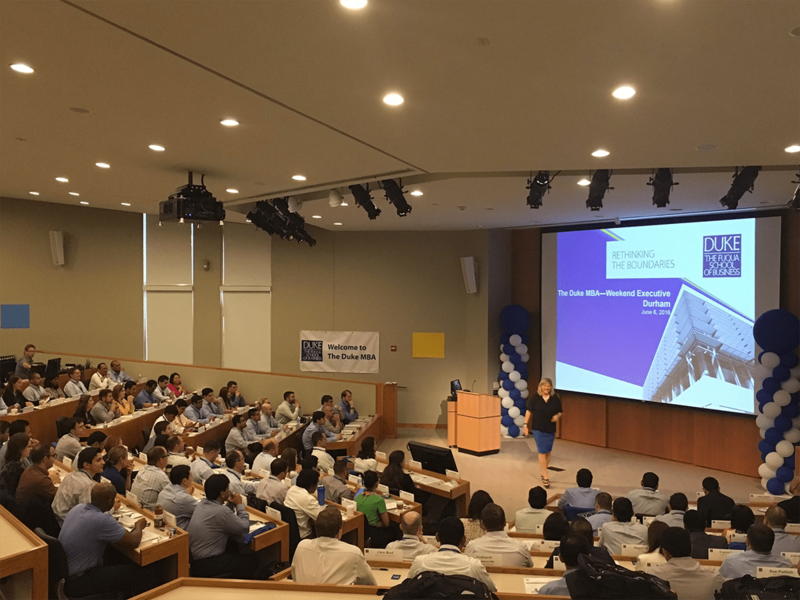 Admission to the Weekend Executive MBA program is highly selective and is based on your comprehensive experience—work, personal, leadership, and beyond—and how your ambitions and values align with what Fuqua has to offer. Your first step? Connect with Erika Glander, our Weekend Executive MBA counselor by email or by phone +1.919.660.7705. Because “fit” is so important when deciding on an MBA program, the counselor will help you determine if your story and motivations are a good match for Fuqua —and vice versa. We are accepting applications for the next Weekend Executive MBA Class, which starts in May 2019. Degrees are conferred in December 2020, and the graduation ceremony is in May 2021. Reapplying: Contact us before you begin the admissions process again. Please email Erika Glander, our Weekend Executive MBA counselor or call +1.919.660.7705. Learn more about a typical Weekend Executive MBA class. You must have a minimum of 5 years of full-time work experience and currently be employed full-time to qualify for the program. Because the Weekend Executive MBA academic environment is demanding, fast-paced, and requires strong quantitative and analytical skills, the admissions committee pays particular attention to the quantitative segment of your test scores, your performance in quantitative and business undergraduate courses, the quality of your undergraduate institution, and your work history, including the types of quantitative work you’ve been exposed to. You must include a current business resume or CV. Start with your current position, and include any relevant volunteer work. Please make sure the experience and education sections list dates (month/year). Your essays allow us to get to know you as a person and help us understand what drives you and inspires you. You may use the essays to fill in any gaps, or provide extra details on key areas of your application. Proprietors or principals of a company can ask a client, board member, or other professional colleague to write a recommendation. Visit our FAQ page for answers to the most frequently asked questions for our Weekend Executive MBA program. You can also reference our Weekend Executive MBA student blog to hear students’ perspectives on residencies, maintaining work-life balance, and more.